Dominica offers much more than the typical Caribbean destination. Although not fringed with white sand beaches, large casinos or an array of all-inclusive hotels, what you will encounter is truly breath-taking. Dominica is a unique ecotourism destination and offers easy access to an array of magnificent waterfalls, rich black sand beaches, luscious, natural beauty, and the luxury of feeling you have stumbled upon your own private island paradise, still unspoilt and prestine. In fact, one recent New York Times article compares a drive through the interior of the island as driving through "a fruit salad." In 2011, the editors of the pestigious National Geographic Traveler named Dominica as one of their 20 hand-picked best trips of 2011, for travellers looking for an out-of the ordinary destination. The people are real, warm, down-to-earth, have a genuine love for their island and are the most hospitable you'll ever meet. Various local companies (such as 'Wacky Rollers') offer exciting tour packages for the thrill seeker. These may range from an aerial/tram ride through the rainforests to a tube ride along a river to an opportunity to swing from tree to tree on a harness in the forest. Most of Dominica's beaches more closely resemble those found in Hawaii rather than on other Caribbean islands. They are unique for the region as they are mostly volcanic in origin and contain rich, velvety, black sand. Although most beaches are black sand beaches, beautiful white sand beaches can also be found on the northern coastline of the island. The waters are warm and provide a wonderful opportunity to truly relax and unwind. In addition, most visitors are pleasantly surprised to find that even the most beautiful beaches in Dominica are often quiet and provide almost a private beach experience. Due to its lush, rugged terrain and tropical climate Dominica provides the ideal habitat for a variety of birds. Close to 200 species have been identified on the island including the Sisserou and Jaco Parots which are native to Dominica. Due to its rugged interior, Dominica has become a top destination for the new, exciting adventure sport of Canyoning. Canyoning is also referred to as kloofing, canyoneering, waterfall rappelling and abseiling, and is a must do activity for the adventure lover. This is the region of the island inhabited by the indigenous Carib Indians who have a rich and unique culture and heritage. A visit to the carib villages is sure to be a memorable experience and the people make their own local hand crafted items which can be purchased. This sport is increasing in popularity on the island, with some businesses catering to it. There are many tracks and trails on the island in addition to paved roads which make cycling, for those who have the time, a wonderful way to see the island. Dominica's rich culture is a fusion of African, Native Carib Indian, French, and English influences. This is evidenced in all aspects of island life including the food, the language, the music and the dance. Many of these can be experienced during the island's many festivals held throughout the year. These include the World Creole Music Festival, DiveFest, Carnival, Independence Celebrations and a host of village feasts/festivals which attract many visitors year round. Due to its rich, volcanic soil and abundance of rainfall, Dominica hosts a rich array of unique vegetation and beautiful flowering plants. These can be seen throughout the island, but perhaps most noteworthy are those found in the Botanical Gardens and the Morne Trois Pitons National Park which has been named a World Heritage Site. Dominica offers many opportunities for short, medium and long hikes, that vary in their degrees of difficulty. The visitor also has multiple opportunities for exploring the tropical wilderness by foot with or without a guide depending on how strenuous the path. Many of the trails are well marked and established, although a trip to the boiling lake or a mountainous hike should be done with the assistance of a guide. Other great attractions include the Emerald Pool, the Freshwater Lake, Titou Gourge, and numerous falls such as the Trafalgar Falls and Sari Sari Falls which are located across the island. These include various colonial forts such as Fort Shirley at Cabrits National Park, as well as several colonial buildings. There are also many must see historical sites of interest near the capital, Roseau, including the Old Market and the Old Mill Cultural Center. Horseback riding provides a wonderful opportunity to enjoy an array of local wildlife and vegetation. 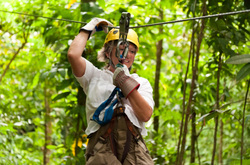 Enjoy a tranquil ride through the rainforest or along a lovely mountain trail on a docile, well-trained horse. This mountain located in Roseau, provides one of the best look-out points to view the entire city of Roseau from above. Diving is especially rewarding in Dominica because of the richness of its deep sea bed which displays an abundance of colorful marine life, volcanic vents spewing bubbles and hot water, sponges and a multitude of coral. Dominica is world renowned for its awesome snorkeling. There are numerous places, just off the coast where you can experience a vast range of beautiful, colourful underwater life in warm, crystal clear waters. Dominica is a fisher’s paradise with numerous locations in which to fish and almost year round ‘good fishing’ weather. 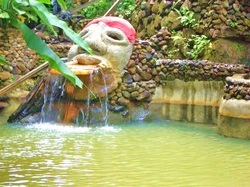 Due to its volcanic origins, Dominica boasts many thermal springs. These contain mineral deposits which many believe to be therapeutic and healing. Visitors can soak in multiple pools, ranging in temperature from cool to very hot, which will undoubtedly result in a wonderful feeling of relaxation. Dominica is a water lovers paradise. Along with its beautiful beaches, and the amazing underwater world that can be explored along Dominica's coastline, the visitor can also take part in exciting above-water activities such as kayaking and river tubing. Whales are present all year around, and there is a high rate of success in spotting whales or dolphins, about 90%, on a whale watching excursion. However, the peak season for whale watching is November to June. Dominica has very friendly wildlife; no poisonous snakes or spiders, or monkeys to grab your hats! There are close to 200 varieties of birds including our many unique parrots, the most noteworthy being the Imperial parrot or Sisserou Parrot, our national bird. There are also numerous “Mountain Chicken”(a large frog and delicacy on the island), over 10 species of bat, about 55 types of butterfly, etc. Check out the Discover Dominica Authority for more information on the host of activities that Dominica has to offer!